War Veteran George Tice of “Vets Ride 4 PTSD” announces that he must put his journey to Tallahassee on hold after receiving an urgent call from his wife who learned she must undergo surgery due to a blood clot. George Tice began his bike ride to Tallahassee this past Saturday, October 27th at 10 a.m. escorted by American Legion Riders, law enforcement officers and supporters. By the end of the day Monday, October 29, he managed to bike more than 132 miles and was located just outside the town of Sun City Center when his wife called with the alarming news of her failing health, putting his journey on hold. Over his three-day journey, Tice visited community leaders at American Legion Post 103 in Punta Gorda, Post 110 in Port Charlotte, and Post 266 in Sarasota, as well as the Southeastern Guide Dogs in Palmetto, where he proudly presented each with an American flag donated by the Modern Woodman. Due to his wife’s health scare, the morning of Tuesday, October 30, Tice made the decision to return home to be by his wife’s side to comfort her during this difficult time. His wife may be scheduled for an Angioplasty to remove a clot near her kidneys in the upcoming days. 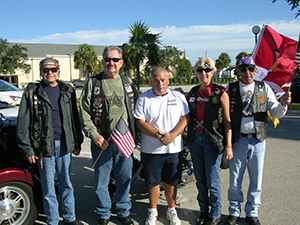 Tice remains passionate about his cause to bring awareness and support to veterans who suffer from PTSD, and hopes to resume his ride to Tallahassee from Sun City Center where he left off. “I am so appreciative of the support I have received, and do not want to let supporters down,” Tice says. “Once my wife has recovered from surgery, I do plan to continue the ride where I left off and focus once again on my mission to raise awareness and support for Veterans suffering from PTSD,” he added.